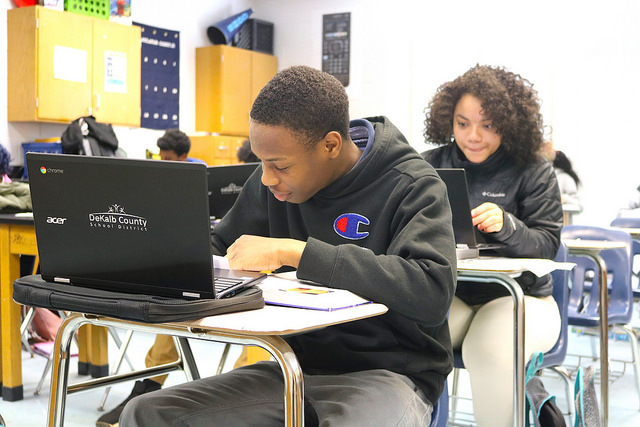 As of March 2018, more than 45,600 Chromebooks have been deployed to help DeKalb County School District (DCSD) students complete assignments and study courses. 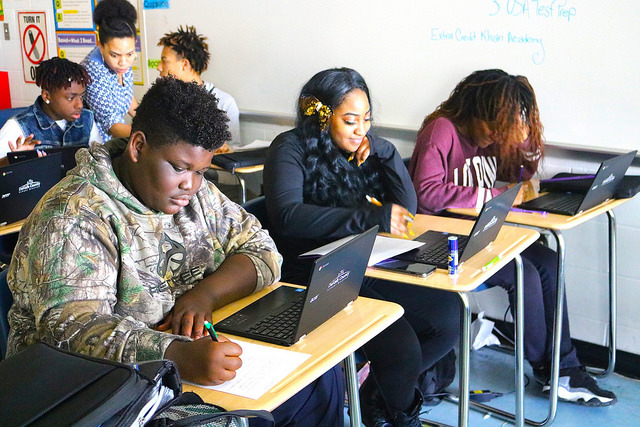 More than 6,800 Chromebooks have been deployed to teachers to make issuing assignments easier. Approximately 5,000 DCSD students now have access to the internet because of mobile hot spots. This is the first phase of DCSD’s Digital Dreamers initiative, and it’s showing no signs of slowing down. The Digital Dreamers initiative is a comprehensive technology program designed to enrich the educational experience for every DCSD student and teacher. The overall goal of the program is to place a Chromebook laptop in the hands of every middle and high school student and teacher by August 2018. DCSD also partnered with Sprint to give high school students mobile internet hotspots, which allow students to access the internet from anywhere they please. According to Cedar Grove High School junior Madison High, having a Chromebook laptop and hotspot at her disposal allows her to complete homework assignments before she leaves campus. Before Digital Dreamers, High said she had to use her own personal cell phone data to communicate with her teacher via email. Now, she can achieve such a task in a matter of seconds without having to worry. 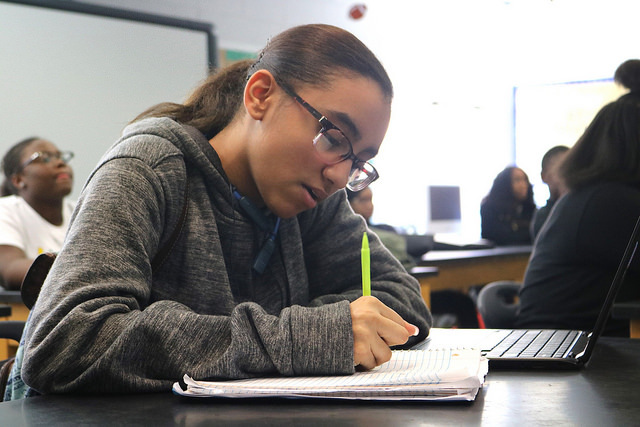 High said her grades and test scores have improved because she no longer has to worry about going to the library to complete online assignments. In addition, because of her busy schedule in School Senate, Superintendent Student Advisory Council, SCCLA, morning announcements and student government, without a way to complete assignments remotely, her grades would have suffered. Cedar Grove senior Tayler Ellis shared a similar story. She said all of her teachers—spanning all subject areas—try to incorporate resources found online into lessons and coursework. In her AP Psychology class, Ellis said her text book is entirely online, which helps her, her classmates and the entire school save money. Ellis said she has completed assignments on the bus, at home, in a car, at school—anywhere she pleases. She said her favorite place to get things done is in her room, headphones on, focused on her Chromebook. “Our work has increased, but it’s easier to maneuver,” Ellis said. Like High, Ellis said her commitment to being Cedar Grove’s chief programming officer, student government, and a leadership business academy keeps her busy. Luckily, DCSD’s Digital Dreamers has met her half way and kept her on task. Instructional Support Specialist at Cedar Grove, Angela Woods, said Digital Dreamers has totally changed the school’s instructional environment. She said the program has provided equal footing to teachers and students, allowing both to remotely connect to the classroom if needed and have an easier time completing assignments. Woods said that the initiative has allowed students to make up assignments easier and faster, whether a class is missed by illness, a family emergency or even suspension. She said high school classes are beginning to resemble college courses more and more, but still retain the deep teaching and learning style of DCSD schools. At Cedar Grove the Digital Dreamers initiative has transformed the media center from a traditional library to a collaborative learning space where students come together and learn. “We’ve reached the point where if a student does not have a device, it’s important we get them one—otherwise they’ll fall behind,” Woods said. DCSD’s Digital Dreamers initiative is spear-headed by Chief Information Officer, Gary Brantley. He says the initiative is fulfilling its overall mission of bridging divides between students and online access. Brantley said being able to help students like High and Ellis is why the Digital Dreamers initiative began in the first place. He said Woods’ observations at Cedar Grove can be seen at high schools throughout DeKalb County. Round 2 of Digital Dreamers will begin in August 2018.